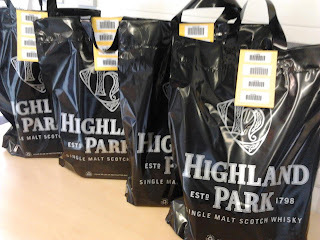 To celebrate World Book Night, which took place on Monday (23rd April), the evil genius behind the Monday Night Murders reading group, put together the Cold Cases Mystery Bags - in association with Highland Park Whisky. Each bag contains four crime fiction novels which haven't been on loan for ten years or more. Following the success of Monday night's event we have some of the Mystery Bags for loan in Stromness Library - so come along and solve the mystery! A peedie reminder that the Stromness Library Reading Group will meet tomorrow evening (Wednesday 25th April) at 7pm to discuss Never Let Me Go by Kazuo Ishiguro. Please come along and join us for an informal chat about the book over tea or coffee. While the Orkney Library Twitterer is off 'doon sooth' to the bright lights of the London Book Fair, to take part in a seminar on Social Reading , there has been exciting news which may see another Orkney Library and Archive delegation heading to the capital very soon! For Dear Readers we are on the shortlist for Library of the Year in The Bookseller Industry Awards! 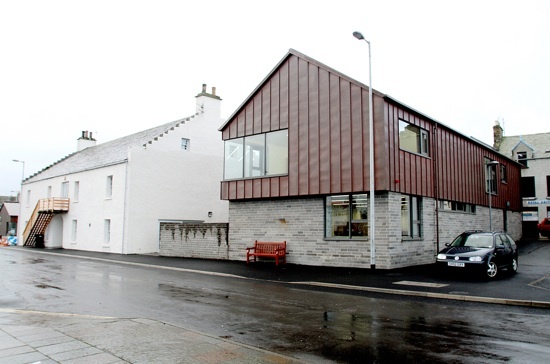 Not just Stromness Library of course, but the whole Orkney Library service, which just to remind you, includes the Orkney Library and Archive in Kirkwall, two mobile library vans which travel to many of the outer isles and rural areas of the Mainland (of Orkney), and for those islands too far away, or with ferry services too small for our vans, we send boxes of books out to readers. We run three Reading Groups (plus another three online); Bookbug sessions, story times and a writing group for children; as well as readings and events by local and visiting authors. As you already know, we have embraced the opportunities offered by modern technology, and, through the wonders of the Internet, this blog, the Orkney Archive blog, our Facebook page and (in)famous Twitter feed, allow us to reach folk from all over the globe - without fear of sea sickness, flight delays or carbon emissions! Gosh we're in danger of coming over all "bigsy" * so will stop now and just keep our fingers crossed as we wait for the result. But of course we won't let this potential fame go to our heads because our greatest reward comes from happy readers, and we know how lucky we are at a time when many other libraries are under threat and their users facing the loss of a valued service. All libraries are important and special to their users, so please Speak Up for Libraries everywhere and make sure books are freely available to all. For those of you who would like to know more about George Mackay Brown and his work there is an opportunity to learn more from Dr Linden Bicket, who will give the GMB Memorial Lecture on Friday 13th April at 7.30pm in the Pier Arts Centre, Stromness. Linden, a postgraduate research student from the University of Glasgow (who wrote her PhD on GMB) recently spent six weeks in Orkney catalogueing a collection of GMB's papers, which have been placed on permanent loan with the Orkney Library and Archive by Archie and Elizabeth Bevan. Funding for the ‘George Mackay Brown: A Literary Executor’s Archive’ project came from the award of a British Academy Small Grant. The GMB Memorial Lecture is organised by the GMB Fellowship, and admission is £5 (£3 concessions) at the door. The library will be closed on Monday (9th April) for the Easter Monday public holiday - so pop along today for your holiday-weekend reading. With a glut of chocolate eggs filling the shops straight after the New Year, and hot-cross buns seemingly available all year round, it seems traditional festive celebrations around Easter have become just another opportunity for consumption rather than a focus for communal participation. 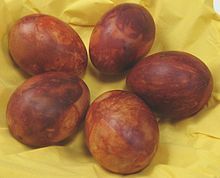 The children took their treasures home where 'the eggs were boiled, and coloured in various hues; and on the Saturday or Sunday there was a feast of "pace eggs" and spicy hot cross buns'. We wish you all a weekend of celebration, whether your eggs are hard boiled and decorated or made of yummy chocolate, may you enjoy their symbolic promise of new life and renewal. Apologies for the unintentional, extended silence, there's been a nasty bug going round and between that and annual leave we've been away for longer than expected. But we're all better now and ready to resume normal service, whatever that may be!